I finally caved in an bought a couple of Glitter Gal holographic polishes. I've seen heaps of posts on blogs around December and January from people who were sent a bottle to review, so I thought I would try some out myself. Where was I, oh yes, I bought Marine Blue and Black. Marine Blue is a rich green toned royal blue. The holographic particles are subtle indoors and more obvious in the sun. The holo particles are more scattered like the China Glaze Kaleidoscope holos and the Artform holos, not linear like Nfu Oh and China Glaze OMG. 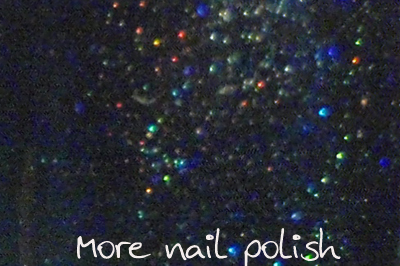 But I don't think there are nearly as many holo particles in these Glitter Gal polishes compared to the others mentioned above. Up close to see the holo. Black. I'm so disappointed with this one, I really wish I'd bought another colour. I wore this all day and I don't think I saw even the faintest flash of holo jump up and say 'Hi, look at me, aren't I pretty'. I was just flat black cream all day. 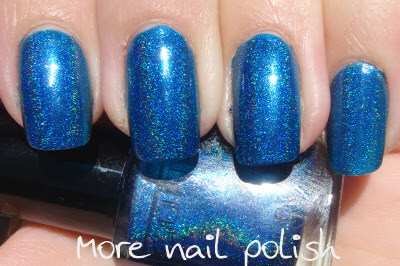 Flat cream polish is nice, I like it, but not when I've paid good money for a holo. Up close to see the holo. See, it is there when you zoom in close. The formula of these was great, not watery and both had good pigment. Only two thin coats required. As other people have said, the bottles are small. 9ml. And the polishes have gone up from $9.95 to $11.95 each - ouch. Which is a little steep for such a small bottle. I think for my dollar, I prefer the Artform holographics, which you get a full size 15ml bottle for $10.95. Although you don't get quite the same range of colours as with the glitter gal, and they don't post internationally. 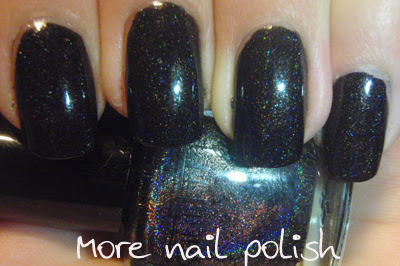 I dunno, maybe the combo of the slow delivery and the disappointing black polish is turning me off this range?? Gorgeous :) Both of them. These are great! I've never heard of this brand before, thanks for sharing. Agreed! I'm not loving on GG holo's either. An international friend on MUA ordered and had some sent to me (so I could send on to her), she also paid express but also took over a week to arrive. I also like the formula but wasn't particularly impressed with the sparcity of holographic particles. Seems like GG added just enough to be able to call them holo's. I came across a store sell out and bin dived for a bunch of them at $4 each. Still sitting untouched in the cupboard. I would definately spend my $$ elsewhere. Lalica - I'm still not sure I like the black though. FromTwinings - I'm soooo glad someone else feels this way. I've only read other bloggers raves about these and was expecting so much. Maybe I just picked the wrong colours. You did well to score them for $4. I'd pay that, but not $12 again.